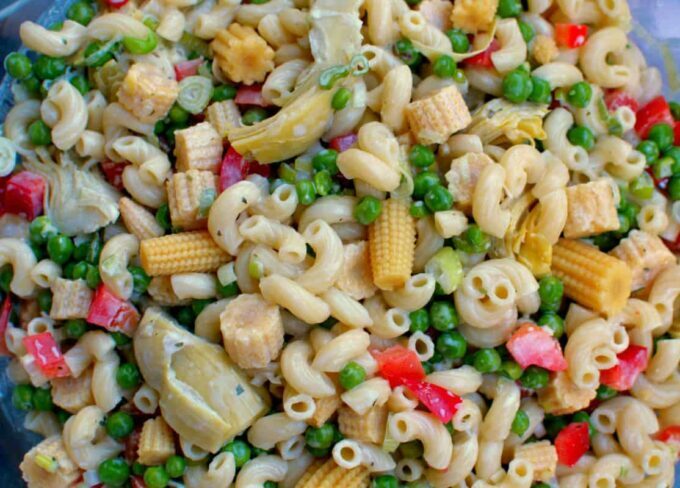 Pasta salads are some of the easiest, and most satisfying dishes to put together for a quick meal. 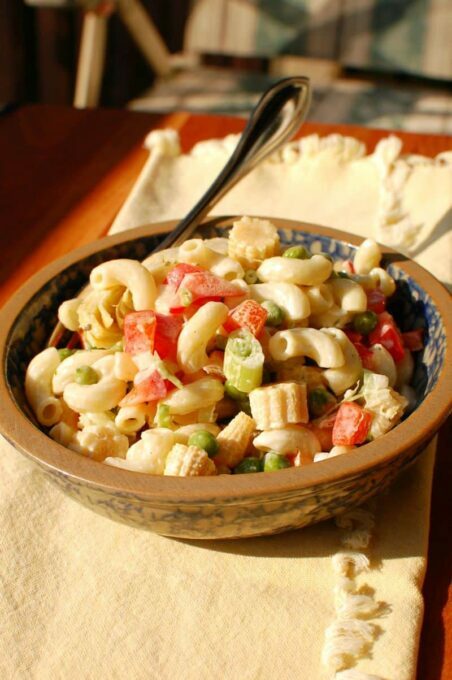 This easy, tasty pasta salad is no exception, but it does include some special ingredients. One of my favorites is tender, baby corn. Then there is one of Mary Jo’s favorites, marinated artichoke hearts. Combine all the ingredients and dress it with a buttermilk ranch style dressing that has added spices and a little of the marinade from the artichoke hearts and it makes for some good eating. You can serve this as a meatless side dish or add some cut up chicken for a full blown meal. This recipe makes a lot too, so this would be really good for a pot luck dinner with a group of friends. Leftovers are no problem either. There is just enough extra dressing to spark up the flavors the next day. 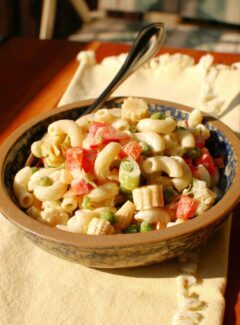 This easy tasty pasta salad recipe is from Penzey’s spices. Penzey’s is my go to source for great spices. If you are lucky enough to have a Penzey’s near you, you can go browse their selections, (plan on spending quite a bit of time as they have so much to look at). If not, they have a wonderful on-line mail order service which is quick to deliver. When you order, they always send a sample of a different spice, too. Order $30 worth of spices and the shipping is free. Check it out! The recipe calls for Penzey’s Mural of Flavor which is an excellent blend of spices, shallots, onion, garlic, lemon peel, chives and orange peel. MaryJo likes to use that when she bakes flat bread by brushing the unbaked bread with olive oil, then sprinkling on Mural of Flavor. We didn’t have Mural of Flavor, but we did have Penzey’s Fox Point seasoning, so we used that. 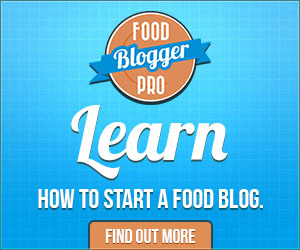 You can substitute another similar blend you might have in your pantry. The extra spice gives the dressing a flavor boost that is way beyond ordinary ranch dressing. Mary Jo and I had this as a side dish with grilled burgers and it was wonderful. In a small bowl, combine ranch dressing mix and desired seasoning with the 1 tablespoon of water. Let soak for 5 minutes or more. Stir in buttermilk, mayonnaise, and reserved artichoke marinade until smooth. 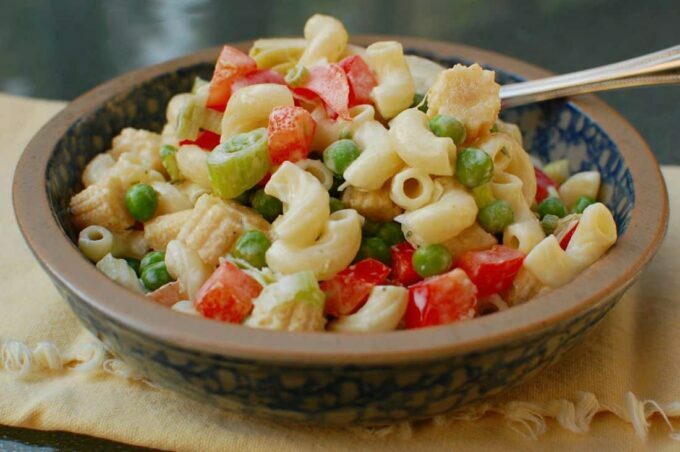 In a large bowl, add peas, green onion, red pepper, corn, cooked pasta, and optional chicken. Toss to mix. Add about 1 cup of dressing and the artichokes and fold in. Reserve the remaining dressing for leftovers or as just an added kick to your salad.